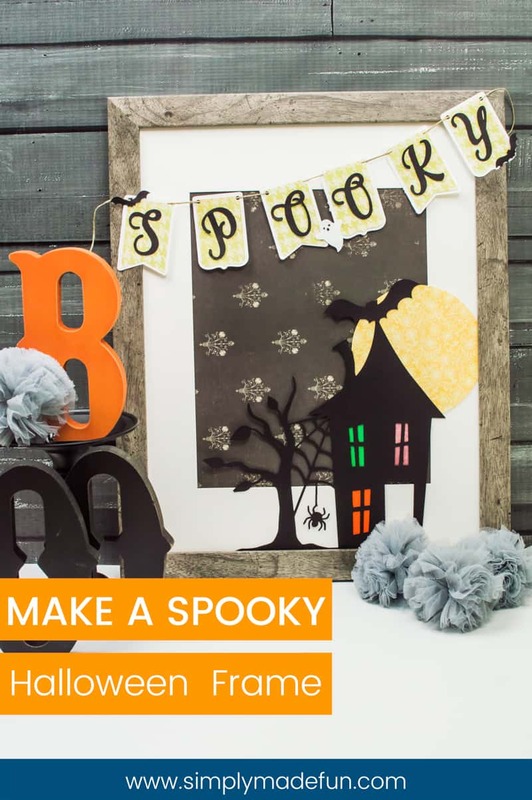 If you have extra cardstock laying around, this Spooky Halloween Frame would be the perfect afternoon DIY to do with your kids! Have you ever started a project and then halfway through realized that it’s going in a completely different direction than what you had originally wanted? That’s exactly what happened with this banner. Originally I just wanted to make the banner and was really excited with how it turned out. But as I was putting it together I started to realize that I needed something inside the frame so that it wouldn’t look so minimalist. After a quick search in the Silhouette store I found a Halloween file that would go perfectly with the banner! I’ve never liked the scary aspect of Halloween. I’m all about the cute stuff and could do without the creepy clowns and icky spiders on every aisle at the store this time of year. Because of that, I don’t typically decorate for Halloween. But I just couldn’t resist making this spooky Halloween frame. Even with the spider (ew) I still am a fan of how cutesy it is! Download your own Spooky Halloween Banner! To be honest I’ve only made a banner once, so I decided I needed to change that! 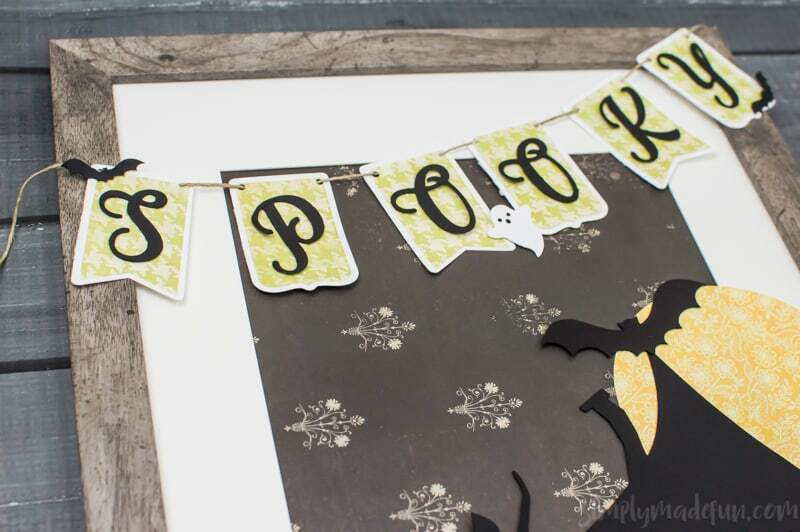 And what better way to kick off a round of banner making than with cute ghosts and tiny little bats? First you need to download the file (y’all know how much I love a good file!). I own the Silhouette Designer Edition for the design studio so I’m able to cut multi-layered designs layer by layer. It’s one of the main reasons I love and highly recommend investing in the designer edition, and it’s under $30! Cut all the pieces of your banner and then lay them out in front of you. Then start to layer the pieces one by one and glue them together. Once they are all pieced together start to hole punch each piece of the banner, once on the left and once on the right. After you have all the holes (12 in total), loop the twine through them and space them out the way you’d like. PRO TIP: I tend to put a small piece of tape on the back of the cardstock that will hold the pieces of the banner in place once I hang it up. I used extra glue dots to attach the banner to the front of the frame, then cut out the Haunted Mansion, different color boxes for the windows, and the moon. I then placed the mansion and moon in the frame along with a piece of patterned cardstock for the background to finish everything off. I have to admit that this is not what I was going for when I set out to do this project, but I absolutely love the finished result! I may not have a ton of Halloween decorations around the house but I’m pretty excited to display this spooky Halloween frame. It’s simple and cute with minimal scare involved. It’s definitely my type of Halloween decoration! What’s your favorite Halloween decoration you put up each year? For more Silhouette Projects, check these out! Ooooh – this is so darling, in a “spooky” way! I love decorating for holidays and seasons! This would be so charming to have out to get in the spirit! 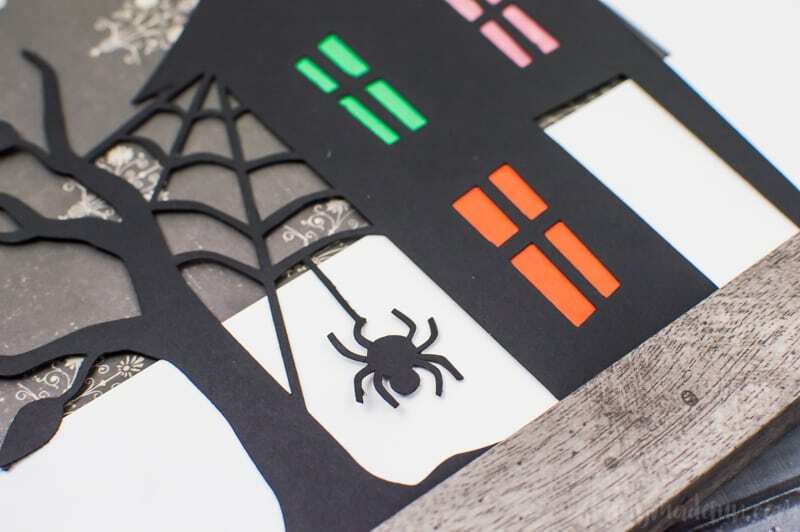 What a cute little Halloween project with kids or bigger kids **ahem** aka: ME hahahahahhaha! Thanks for sharing babe! This is an adorable project. I can’t wait to try this with my girls! Thanks for sharing! That’s a cute way to celebrate the season. It would be cute on a mantel. Love the colors! This is so stinking cute! I just wish my kids like to do crafts so I have someone to make this with me! I do NOT like the scary aspect of Halloween. I only like friendly jack o’ lanterns and no witches, please! This is so adorable! What a cute idea to decorate for the Halloween. I am going to copy this. This is so totally cute – I am late decorating for Halloween this year, good thing there are 31 days in October. This is so cute! What a perfect halloween decoration for this season. I am so happy people decorate for halloween. It is my favorite holiday. I’ve never done anything like this before! It’s awesome and it’s perfect for the season. I like making my own decorations for each season or holiday! I’d love to give this a try! I enjoy Halloween more when it’s not always scary too! I love how this turned out in the end, so cute and fun! Oh this is so cute! I have been trying to find fun ways to decorate this year, and I think this would be a lovely addition! That’s so cute! It would be perfect for Halloween costume pictures each year. This is a great project. I have noticed that the Halloween decor the stores are selling is getting more and more expensive. I love being able to save some money and make it myself. Wow! That is an awesome frame. I would like to create one for my son. My daughter is loving Halloween decorations and especially spiders. She will love the little spider coming down the web. I love this frame! It’s so cute! I’m the opposite of crafty and I’m always looking for easy and cute crafts like this. What a fun project! I think I will make one with my kids this weekend to help decorate for Halloween! I think this turned out great!! Super adorable, and I think I definitely could do this. Sometimes I start crafts but never finish them! Very cute and fun! Halloween is one of my favorite holidays to decorate for and this is adorable! I think this is totally something I could do, thanks for the inspiration. That is such an awesome frame. I could use it to decorate our door. I might try this on the weekend. My kid would love to make something like this! How adorable and fun. Perfect decor for the season! Absolutely creative and artsy! My kids would love this! Promoted learning through play!! I”m not into the scary of halloween but my daughter and husband are. They love haunted houses and haunted corn mazes. No thanks.